It is strange that I harbor such a passion for foreign languages when I hail from the monolingual country and continent of Australia. What I love about learning languages is not the theory and grammar but the revealing of a culture, its history and a new way of being. The truth is I have no real practical use for the languages I speak other than my love of immersing myself and participating in new cultures and places. In Europe I regularly meet people who speak at least two or three languages and use them on a daily basis in work and life and I am often envious of them. So here I am in Andalucía investing a year of my life in the Spanish language and culture. It’s the third gap year I have taken (the first one was as a sixteen year old exchange student to a small town in the French part of Switzerland) but it is the first time I have done it with my husband and two children joining me for the ride of a lifetime. The children have little choice since they were born into a family legacy of exploring other cultures – they have three nationalities/passports each. 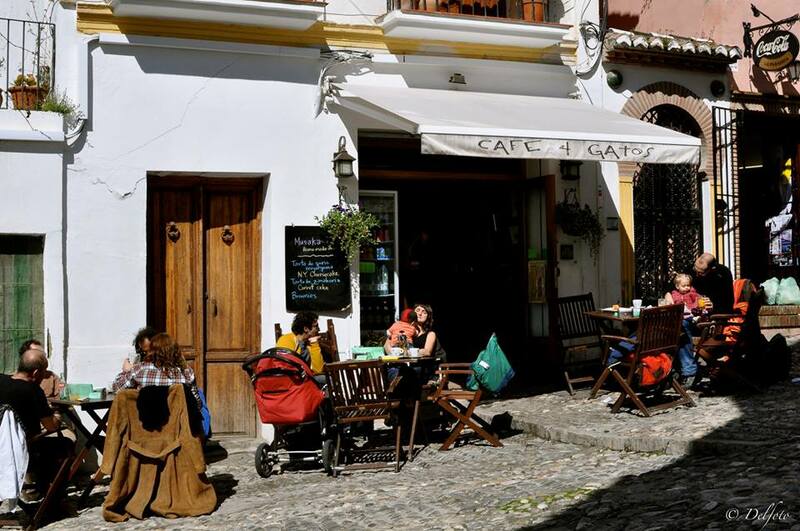 I recently completed a 10-week intensive Spanish course at Castila International Language School, a school conveniently located in a beautiful old Carmen in the lower Albaicin of Granada, 150 metres from my rented home. I chose this school out of the many here in Granada as it seemed to have more character and personal engagement than the others and it promised small class sizes for optimal learning. I enrolled into the course with some trepidation as I wondered whether I would be the oldest in the class; whether the rest of the class would be out all night while I was rushing home to look after my children and whether I would have anything in common with a group of twenty year olds, five days a week for ten weeks. You see Granada is well known for its university students who swell the population by 80,000 during semester time and party like it’s 1999 (no actually that was me partying in 1999, they were too young). To my surprise and good fortune, when I arrived at Castila in September, my fellow students were a fascinating bunch from around the world, evenly spread from 18 through to 70 years of age; something that I later learned was quite usual at this school. What a wonderful and eclectic mix of people. I became friends with two fellow students, a Canadian man and an Australian woman both in their sixties who had lived full and interesting lives and were continuing in the same vein. We shared some great stories and experiences over copas de vino, exploring Granada and studying Spanish of course! While studying at Castila, my Spanish advanced in leaps and bounds and by the second month I was privileged to join the advanced group. I say privileged because the advanced group’s classroom is on the top floor of the school that boasts panoramic views of the Alhambra, the Sierra Nevada mountains and pretty much all of Granada. It must be how the school motivates its students to study harder by working your way towards the room with a view. Sometimes the beauty outside the window would distract me, but usually only when we were learning the subjunctive tense; a grammatical tense invented to torture English speakers. I thoroughly enjoyed the teaching approach at the school with the very friendly and personal touch of the teachers. Each day we would have four lessons with four different teachers. Each teacher would bring their unique energy, personality and knowledge of particular topics. The mix was brilliant for me and while I tried to be interested in the grammar lessons, it was the vast amount of cultural, historical and political knowledge the teachers imparted that kept me engaged and excited about learning every day. Getting out of bed in the mornings and arriving to class on time proved challenging for me especially after a typical night out in Granada and the compulsory morning ritual of ‘cafe con leche‘ and ‘media tostada de salmon ahumado‘ at our wonderful local cafe ‘Cafe 4 Gatos‘, but the teachers never berated me for being consistently late to class. They graciously welcomed me without comment and every now and again would remind us that each one of us was in charge of our own learning. Fine with me! In addition to class time, there were voluntary activities organised every afternoon and on the weekends. These activities ranged from paella feasts, wine tasting, visits to the Alhambra and other cultural sites of interest, and excursions to the surrounding mountains. 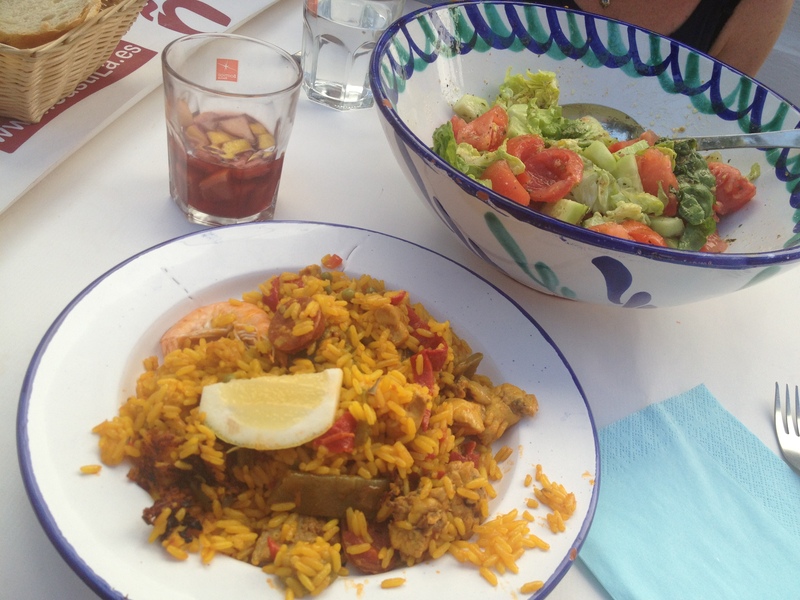 Sangria, salad and paella. You don’t get more Spanish than that! Miguel shared his extensive knowledge of all things Arabic and engaged us in the elaborate Moorish history of Granada and Spain. We went on several excursions with Miguel to the Alhambra Palace, Arabic Studies Centre and the ancient Arabic baths and I believe we learned more from him than a tour guide could have imparted. He was also the most structured of the teachers, ensuring we didn’t get so carried away talking about current topics that we missed essential grammar. 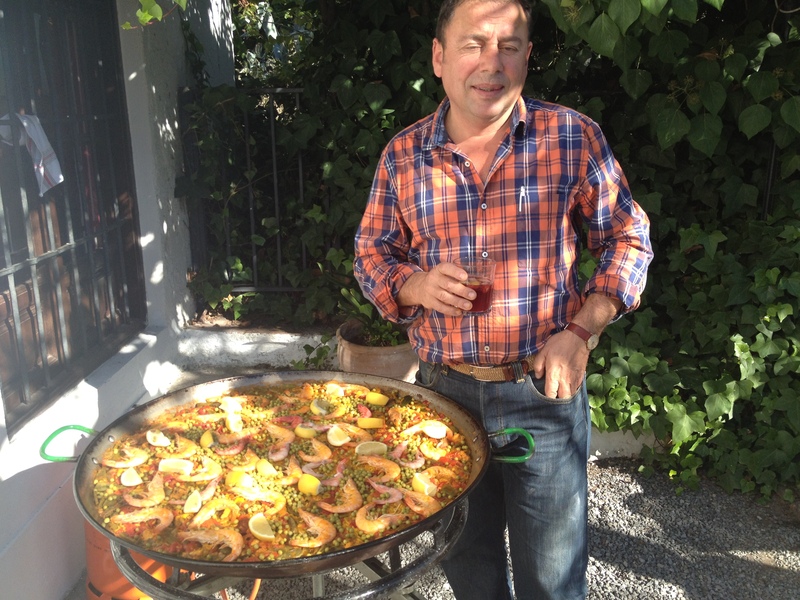 Rafa is a very friendly teacher with an excellent sense of humour and keeps you learning and laughing at the same time. I am not sure what it is about him but many of the women who were in my class over the 10 weeks consistently flirted and swooned in his presence. Some people just have that effect on others I guess! Antonio con gafas talks a hundred miles an hour and is passionate about current affairs and politics. At first we all struggled to keep up with his rapidfire Andalucian accent but after a while I began to understand and thoroughly enjoyed our political debates about the economic crisis, the release of the ETA terrorists and bullfighting among many other topics. I attribute my knowledge of Spanish current affairs to Antonio con gafas! Antonio sin gafas is generous in sharing his ideas about economics and day-to-day life in Spain. He can explain much about the changes in Spanish society over the years and he has a passion for making wine on his farm. We visited his farm one day to pick and juice grapes for his wine production. 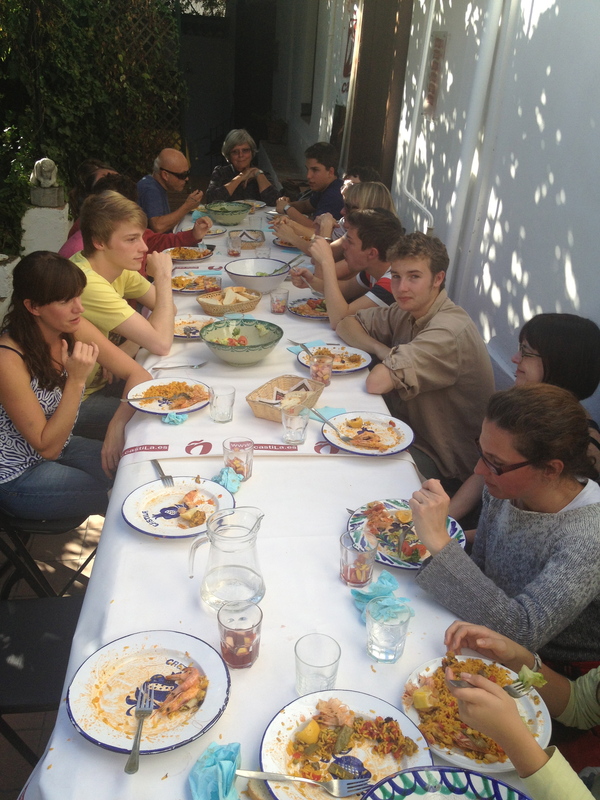 We had a traditional feast while also learning about the winemaking process. I probably shouldn’t admit to this here but in my class we used to see if we could get Antonio off track and talking about a topic other than grammar. We did this very successfully most days which was fun because he had a lot to say on many topics! Paz is a gorgeous and passionate woman who can teach you anything you want to know about Spanish literature and history, which she studied at university. She taught us about the most important Spanish writers, poets and singer songwriters. I discovered quite a bit of music through her and am grateful for that. All the knowledge accumulated over 10 weeks at Castila now informs how I observe and understand Spanish life here in Granada. Overall I definitely learnt more than a language and I would highly recommend the school to anyone wanting to come to Spain to learn the Spanish language and culture. And if you want to learn Spanish before you arrive in Spain, there is a fun online product created by Languages Direct that allows you to learn while watching sitcoms. Alternatively there are free online language learning tools such as Duolinguo. Thanks Tash!! After several silent months, I’m writing again! Hi! I’m so glad I found your blog! 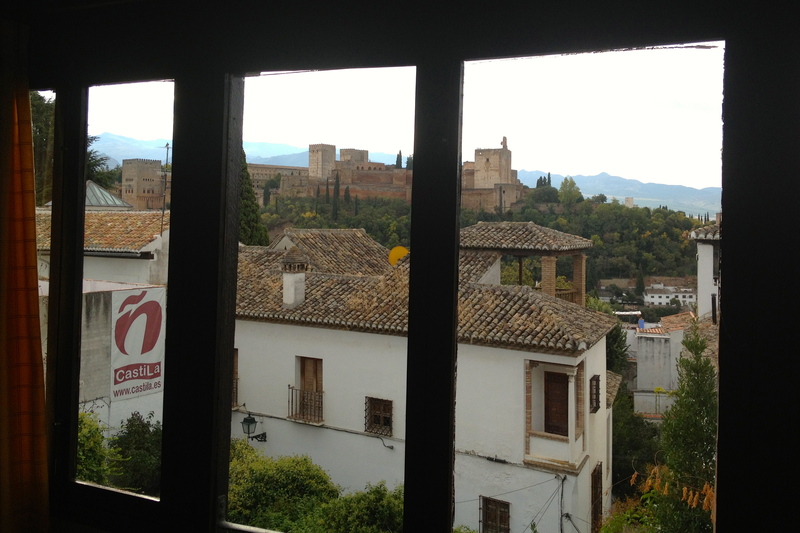 We are thinking of spending a year in Granada too, 2016-2017, with our daughter who will be 8 then. We are Canadians (Québec), although she and I also have British citizenship. We are all blingual (French/English) and speak pretty good (Mexican) Spanish after 4 3-month trips there in the last 12 years. In which school did you decide to register your kids? Spanish, bilingual, private or not? I will definitely keep up with your blog – so inspiring! We enrolled our children into a regular Spanish public school to make the most the Spanish cultural and language immersion. SO far so good and the children are learning Spanish well. Some culture shock in the difference of the school system. It seems like you have had some great time there. I think your children will find Spanish relatively easy to learn since it is considered to be one of the easiest languages to learn for speakers of English. i have always wanted to visit Spanish and moorish heritage that is left there by Muslims. Hi! I’ve just found your blog and had a happy hour playing catch up.We were lucky enough to be able to take time out (in our case we bought a sailboat and spent three years in the Caribbean) and it does refocus you. Back in the UK for 6 years now we’re planning to leave for mainland Europe. As a committed Francophile I’d always imagined we’d be in France but now I’m not so sure.. Your blog is beautifully written as well as informative and I’m looking forward for the next few months. Enjoy planning your next adventure. I am glad you considered Granada as an option and that you found my blog in the process. No doubt you will make the most of wherever you land! I hope the wet UK winter passes soon. It has been quite wet down here too but perhaps not as relentless as what you are experiencing. Safe and happy journeys! so happy i i found your blog! I will be traveling alone with my 2 year next month and will know not a soul! I am thinking of enrolling in either Castilla or Delengua spanish school for 10 week intensive. Good to see you had a nice experience with one of the schools I am considering. I too, am a older student of 35 years in age! Wondering if you may be able to suggest a childcare for my daughter although I do see that your children are quite a bit older than my daughter. Selecting a nanny or nursery has got me the most nervous about making the 3 month trip to Granada! I just found this blog, some years later! Really wonderful! My wife and I spent a month last January in Grenada, and studied at Castila. It was a wonderful experience and we hope to go back as soon as we can. Thanks for such a wonderful account! 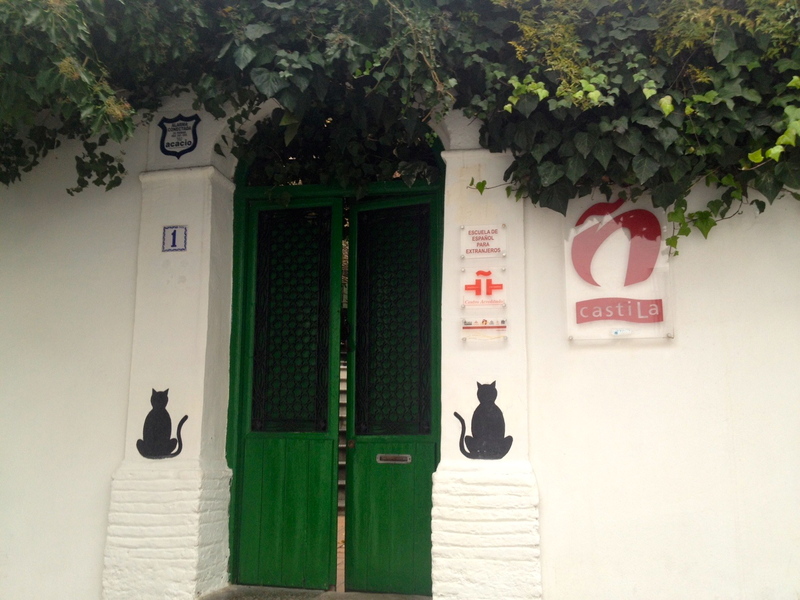 Granada is a wonderful place to live, and Castila is as good as it gets in terms of language instruction.